Without Pollock’s painting hers is unthinkable. Rachael Haynes’ contemporary feminist art practice brings together performance, drawing and installation with pedagogic, curatorial and collaborative strategies. 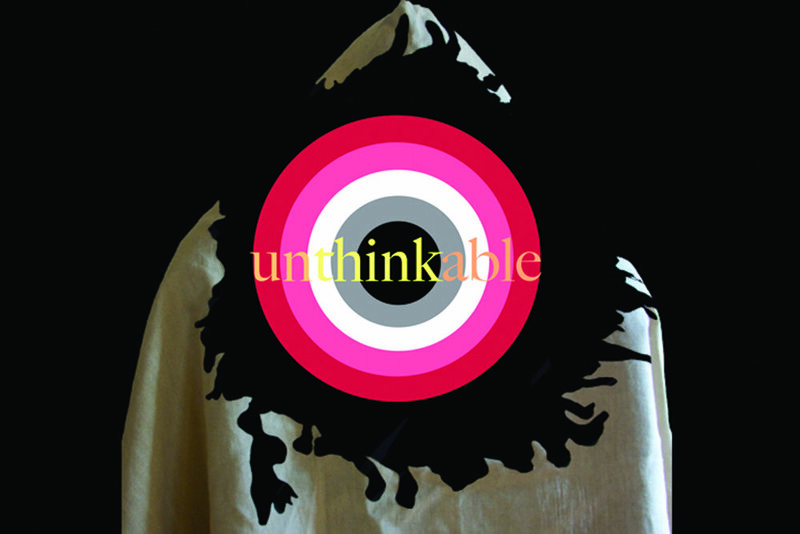 Unthinkable is a new installation that incorporates fabric works and a lecture performance video to pursue a subjective engagement with feminist histories. 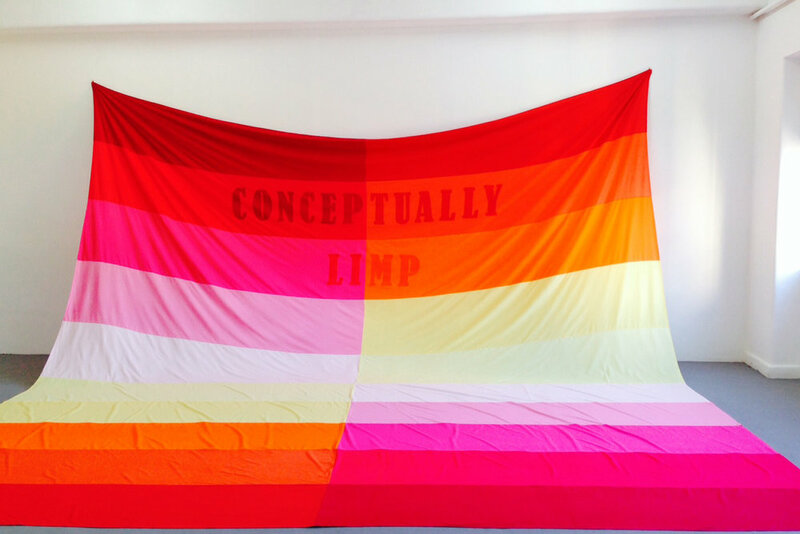 The works perform a playful mixing of language codes and systems – drawn from art criticism, the histories of abstraction and conceptual art, literature and philosophy – and enacts a gendered redrawing and (re)performing of these texts. By engaging with pictorial, literary and vernacular quotations, Unthinkable replays and reveals the complexities of gender politics, representation and language. IMAGES | Rachael Haynes Quickdraw (Unthinkable), digital video still, 2015.| Images courtesy of the artist. On the 16th June 2014, two months before my thirty-seventh birthday, I read an essay. The author was a well-known artist and feminist writer. She wrote a collection of essays in the 1990s addressing the works of a number of women artists, about which scholarship was scant. Her sister was also a well-respected feminist philosopher. I turned over the pages and listened to the constant rain falling. I was hiding under the blankets, reading. I had spent many content hours of my life here. The words were unsettling. I looked out the window. The frame seemed somehow menacing, boxing me into the small apartment. I felt angry. I was cautious. I could feel my voice rising within my body. Trapped. Years before I lay down in the earth. I covered myself over. I became body. Female. I was more myself than ever before. I was enacting, not death, but life. I turned quickly. My caution was misplaced. I fell. There was no stopping my falling. Would anyone ever know the truth of what went on here today? In two months, I would have been 37. I went into labour in August. In October I would be thirty-seven years old. I was hoping for a boy. My three daughters and two sons were with their father. It was a quick birth by planned C-section. The doctor said he had never seen a baby and mother bond so well. I was exhausted. This was my sixth baby. Each one sucked out the life in me. Her father chose her name. We’re moving to a new city. I’m leaving the small town of my youth and married life – this baby will never know these places. She is a quiet baby. Who knew the truth of that night – what happened to that remarkable young woman? The story was well known in certain circles, although the power circle had effectively squashed it. Flattened it out until the thinness of it was unbearable. Who would speak? It was time – ‘I am the same age as her’, I thought. Time coincides. From one woman to another, mother to daughter, mentor to student. We are distanced from nature, Mother and the imaginary. ‘To grow, the daughter must question the Mother’, I wrote. Women are always falling out of windows. Patriarchy takes care of its own.